Last week I made an activity/learning clipboard that gave us something different to focus and learn each day. I just thought I'd give you a quick update on how it's working. First of all my kids are so excited about this. It gives them something to look forward to all day and they can't wait to do it! Last week we played and learned the rules of baseball, we practiced leading music and we made brownies together. Library day has been great because the kids know they will only have their books for a week so they have been really trying to read a lot so they can finish their books before we have to take them back. For craft day we made cute little flowers out of hands. I saw the idea on Jamie and Kelli's blog called The Junk Box. I like the look of theirs with the yellow pipe cleaner, but we didn't have that on hand so we just decorated the fingers with glitter. I'm thinking about joining the anti-glitter coalition because of how much glitter I keep finding in my house even after a week, but they had a blast so it's worth it. My son even loved it. We just used a boyish print paper for his. 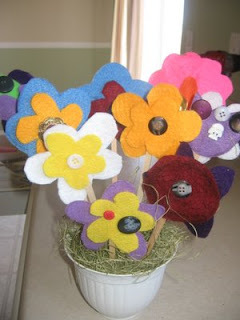 For another way to make super duper cute and kid friendly felt flowers check out Hannah's post HERE. I would have to give the clipboard a big two thumbs up. It forces me to do something really interactive with my kids even when I don't really feel like it, which is unfortunately just what I need. I decided I'd like to give you an opportunity to share any of your creative ideas on Tuesdays. It can be something you've made, a room you've decorated or a fun thing you've done with your kids. Really anything under the sun. They only give you a few options for what to call it and still be free, so I picked Cats on Tuesdays. Ha ha ha. Please don't post pics of your cats, we just need to stretch that into Creative Cat's Tuesday( I don't know if that's actually legal, I may be really irritating the cat community. We'll see if anyone complains). I'll see if I can get this to work. Today is kind of a test run. I would love to see what you are doing! If you don't have a blog and would like to have a project shown just email me a picture with a description and I will post it for you! If you don't have anything to share this week get crafting and be ready next Tuesday!! Shoot, Andy. I'll have something for next tuesday. I'm glad your clipboards are working out well...I think I might have to give it a try!